This was an amazing tour that I would recommend anyone visiting Ireland do. Our guide Paul was very informative and fun and really made the day great. The gardens at Blarney castle are beautiful and well worth the visit alone. Kissing the Blarney Stone is also a great experience, and is a must do if its not too busy. We really enjoyed this tour, it was myself and my daughter. We got to see some of the things we really wanted to see. Rock of Cashel is great with the correct amount of time there, Blarney Castle was great too, enough time to see the grounds also, wasn't crowded at all the day we were there and then Cork City, my daughter wanted to go here but there isn't all that much time there, would have liked a bit more time there. We would do this tour again, driver was very nice. We had a good day weather wise so that helped too. Both non city places were beautiful. Our guide organized our day trip to Blarney Castle from Dublin to the tee. He even sang songs on the bus! We ended our day at the main attraction which made the day progressively better right until the end. We would recommend this day tour! This was a very fun tour. Darren, our driver/tour guide, was very involved with the group and gave a lot of great history on Ireland. He gives you a bit of banter back and forth which made it really unique and fun. Very relaxed tour and gave us plenty of time at all the locations. Great photo stops and we had good weather which made it a lot of fun. I highly recommend Paddywagon for this tour. 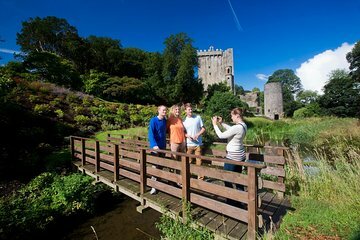 Great value as well for an all day tour of Cork, rock of Cashel, And Blarney. I would definitely use these guys again for tours of Ireland. Had a blast. Our group of 6 took this tour with Paddywagon tours. Our guide was Barry. Disappointed to say the least. Each stop was so rushed and limited that most people couldn't possibly see or do another other than quickly snap a photo or two. Blarney Castle had a 60 minute wait to reach the stone and we had just 75 minutes to do it all. The longest stop was at a rest area on the return trip to Dublin. Our guide, Barry was on his cell phone 90 of the trip, conducting personal business - so much for the commentary? He was not at all engaging or involved with his tour. Such a waste of a nice day. The time at the castle is too short to finish seeing every spot of the place. But overall the tour is fun . Prompt pick up on a brand new Mercedes coach bus. This was an excellent scenic tour. Well worth the price. It is a 12 hours day like stated although it didn't feel like it. There are lots of stops in between the sites so its not as if you're on the coach for hours at a time. The stop in the Cork centre was a bit pointless as we didn't have long there, I would definitely like to visit Cork again because it did look beautiful. We didn't actually end up kissing the stone because the queue but that didn't matter because the whole area is beautiful. If you like nice, quite walks with amazing scenery you'll love it. The whole surrounding area was very beautiful. The driver/guide was good and very informative, plus us the coach itself was nice and big with WIFI and the ability to charge your phone. We were very happy with this tour. Our driver, Richard, was funny, engaging, and gave us lots of helpful information. We loved seeing the Rock of Cashel as well as spending time at the English Markets in Cork. The Blarney Castle was the highlight with its beautiful grounds and stunning views from the castle itself. We waited an hour to kiss the stone, but we still had plenty of time to explore the grounds as well as shop at the Blarney Wool Mills. I would highly recommend this tour! Tour run by Paddywagon was terrible. First, it was a complete cattle-call when getting on the bus. No one checked us off, no one ensured we had tickets, etc. We got on our bus and the driver said the company had overbooked the tour and that 10 people not yet on the coach would not be going. Then we found that the bus not only did not have WiFi as promised (not make-or-break, I know), but the air conditioning was broken. The 12-hour tour was made with no AC. The first stop at Rock of Cashel was not worth it... could have easily been skipped. The ONLY highlight of this tour was getting to kiss the Blarney Stone. Our stop at Blarney was only 2 hours, and it was an hour in line to wait to kiss the stone. I would have liked more time at Blarney. Then we went to Cork after—our driver dropped us off and didn’t give any suggestions for our one-hour stop in Cork... and then mentioned there was nothing to do. He was right. Overall I wish I would have just rented a car and gone to spend the day at Blarney Castle without the terrible experience that this tour was.